This multi-award-winning farm shop, cafe and cookery school hosts lambing week- ends and a young’uns night every Thursday for children. A price-comparison page on the website shows that the farm consistently undercuts the supermarkets on beef and lamb. Some 50% of the food the farm sells is made in its own kitchens, including cheeses and ready meals. Beef, lamb and Gloucester Old Spot pork and fruit and vegetables all come from the Oakly Park estate, where the shop is based. Somerset Foodies such as Hugh Fearnley-Whitting- stall rave about the Kimbers’ welfare- friendly rose veal. Homebred beef, pork and turkeys at Christmas also feature beside their own raw milk. Banish thoughts of deep-fried Mars bars with all the best local Scottish produce from the delicatessen and in-house but- chery selling home-reared beef, lamb, venison, poultry and game. With 8,000sq ft of the best local and home- produced foods, this shop, run by the award-winning Watkins family, is one of the largest of its kind. 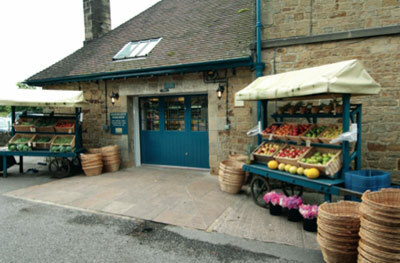 Britain’s first estate-based farm shop opened in 1977 and continues to set the standard for home-produced and local food. Edward and Rachael Jewson put their all into this farm shop and cafe-and it shows. An on-site artisanal bakery, but- chery and deli make it an essential stop for anyone visiting the area. From prime Welsh Black beef hung for a minimum of 21 days to Bodnant’s own Aberwen cheese and honey, and the best artisanal food Wales has to offer. Set up by farmers for farmers, this con- verted cattle shed sells produce from the owners’ farm along with that from a huge range of local producers. One of these in every county would be good. Another family-run, multi-award-winning operation. Andy and Tish Jeffery (with the help of a Friesian cow called Gert) have created a popular venue for food lovers, children and people who want to learn more about farming.